← Why Are We Making Teen Moms Celebrities?!?!? Picking Up the Pieces for Longhorn Nation…. Who knew this would be the happiest moment for the next year for this program? That was a great feeling, right? Well that moment would lead to this…..
And then ultimately to this…. That game still sickens me to the core. I’ve watched that title game in its entirety once. I’ve seen the first half maybe 3 times. I refuse to watch after that. I truly hated seeing a helpless Colt McCoy on the sideline. I hated seeing the smug look on Nick Saban’s face. And I hated seeing our title hopes rest on freshman QB, Garrett Gilbert’s shoulders. We came damn close to pulling off that thing and coming back from such a large margin! So after the shock wore off all of us…Where would we go from here? The team returning for the 2010 season, on paper, looked like one of the best team rosters I’ve seen. Yes, we lost Colt, and Jordan, and Earl on D…. But, we had 3 of the top CBs in the nation and on top of that, a new QB in Garrett Gilbert that showed he could be the new leader for this team and pick up where Colt left off. 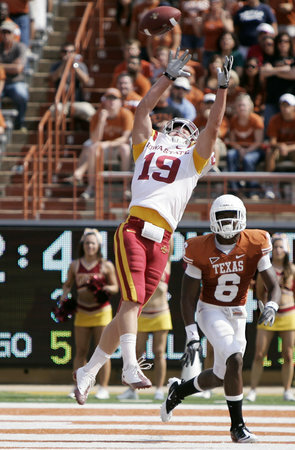 Garrett, high off of comeback that fell just short against Alabama, looked poised to take the Horns into the new age. Didn’t something happen weeks 1-3? I’m skipping through the Rice, Wyoming, and Texas Tech games to get right to the heart of the season’s turmoil. Valid reason for me to never go to a Texas game again. I’ve been to two Texas games in my 5 great years in Austin. I went to the Kansas State game from 2008 that basically got Jordy Nelson and Josh Freeman drafted (there is in fact a draft formula that if you beat Texas, you get drafted. Ask Stephen McGee. ), and this one. Needless to say I don’t think I’ll ever attend another one. This was our first look at the terrible team the Horns would eventually become. This was the first game where Garrett and this offense looked incredibly shaky. Inability to pass block, throw accurately, run the ball, or catch the ball. And of course the bone headed plays on defense and special teams. And….turnovers. UCLA would throw the ball 9 times the whole game for 27 yds….NINE TIMES?! Oh, but then they ran the ball 56 times for 264 yds and 3 TDs….the stats say it all. We could do nothing against a completely one-dimensional team. Surely with this upset on national television they’d come out and play like they should be able to play next week against OU…. Right? OU RB, DeMarco Murray, leaping into the endzone on a td run. The OU game definitely falls into the category “they didn’t beat us, we beat ourselves.” Whether it was the Eddie Jones offsides on the Acho strip fumble recovery or it was Aaron Williams and the special teams unit AGAIN screwing it up for everyone else, we had our chances. Both teams were completely shaky all year and this game reflected that mentality on both sidelines. The return of the scrambling QB. GG can't do it much, but when he did, he found success in Lincoln. In possibly the biggest WTF? game of the season in the landscape of college football (besides our UCLA upset at home weeks earlier), Texas managed to beat Nebraska in Lincoln for their last year in the Big XII. Yes, there were huge drops on both sides, but the Horns managed to contain Taylor Martinez for most of the game (or T Magic as the Lincoln faithful refer to him as). The defense showed for the first time since Rice and Wyoming how dominant they could be. Would this be a simple apparition or would we able to use this game as a stepping stone to saving our season? A stunned Austin crowd watches Iowa State (often bottom dweller of the Big XII) beat UT 28-21. Colt McCoy Day not enough to stop wheels from completely falling off this UT wagon. The dreaded I-35 surprise. We all laughed when one of the Baylor players made the statement some years ago proclaiming that the Baylor Bears would beat the Longhorns in Austin. With the way the season was unfolding, was anyone surprised by this? Sloppy offense and SPECIAL TEAMS again plagued the Horns. I hear it’s really hard to win games when you have to play against yourselves AND the team in the other colored jerseys. Baylor uproots Texas in Austin for the first time in over 15 years. Final: Baylor wins 30-22. Mack would have this look often this season. This night in Manhattan, Kansas would define the 2010 season. 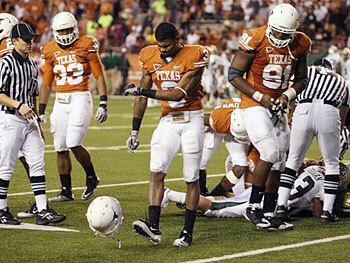 The game the Longhorns truly quit on the field and on the season. Garrett Gilbert would throw 5 INTs in this game. We as a fanbase were screaming to see Case McCoy (younger brother of Colt) take the field and show some of the fire that his older brother had shown us time and time again in years past but Garrett stayed in. Schneider’s bunch could’ve easily dropped 50 on this bunch but out of respect to Mack, called off the dogs at 39 points. Quite frankly, he should’ve done it just to show this “team” that on any given Saturday, you can be absolutely demolished if you don’t care. As much as we hated watching this train wreck, we somehow managed to think that maybe this was the final wakeup call the team needed. We weren’t going to win 10 games. We still had a chance at 8 with a possible bowl victory and a sweep the last 3 games of the season. Could we mount up an answer for Brandon Weeden and Justin Blackmon of Oklahoma State next week? Justin Blackmon burns Aaron Williams for his only TD of the game. Again, the answer to my aforementioned question is no. The Cowboys didn’t need their Stillwater House ‘O’ Horrors to finally beat the Horns, they were satisfied with handing us yet another loss at home. After they hung 26 on us in the first 2 Qtrs and we answered that with 3, we all knew this would be yet another beating. Losing this game 33-16, the Longhorns stood at 4-6 with 2 games to go to hope to get to bowl eligibility. After this and the KSU game, I personally didn’t want to see this team in a bowl game…. Emmanuel Acho caps off a blowout over FAU with a pick 6. UT wins 51-17. Wait….is this an offense with a pulse? Is this a defense that actually plays soundly and without stupid penalties? Who are these guys in the burnt orange uniforms? Yes, it was against FAU. Yes, we were heavily favored. But for once in a good while, it was nice to see this team beat up on a team like they were supposed to. December 6, 2010: Offensive Coordinator Greg Davis resigns. Offensive line coach Mac McWhorter and defensive tackles coach/special teams coordinator Mike Tolleson retire. The shakeup officially begins. The Texas fanbase has claimed it’s first victim in much maligned OC, Greg Davis. Greg Davis pictured with the QB (Garrett Gilbert) that he personally picked to run his 2010 offense. Did he really resign? I personally was indifferent to him as a playcaller. Definitely a hate/like sort of fling. As much as we all hated his love for the WR screen pass, something has to be said for his ability to adapt an offense to the personnel he has. And the fact that he’s also had 9 of the most prolific offenses in Texas’ history under his watch. We definitely needed to make a move at OC but is it all on Greg Davis’ slumped shoulders? I would have to say no. Mac was next on this coaching witch hunt. Could anyone blame this move? For a more balanced run game type of offense to be effective, you have to have a good line. Not great mind you. But good. Texas’ was atrocious. We all are well aware of the existence of one RT Britt Mitchell. We became aware of this gentleman in week 3 against Texas Tech. He allowed 2 of Garrett Gilbert’s passes to get deflected into Texas Tech defenders for interceptions because he couldn’t get a handle on his line assignment. This was easily one of the worst lines I’ve seen in all my years of football watching. There was no way Mac could hold on to his job after their “performance” week in and out this year. Picture I had before wasn't working so here's all 3 guys. Tolleson is on the right. It’s possible that if Mike was just in charge of Defensive tackles, that he’d still have a job in the 40 Acres. Ah, but there’s the catch. He was also in charge of special teams and THAT is what cost him his job. The STs for this team was on par with the offensive line in the running for Worst Part of This Team awards. There were muffed punts, fumbles, bad overall field awareness, and coaching. It was pitiful. After Curtis Brown and Aaron Williams combined to muff punts every week, somehow Mike would let the 2 of them march back out there to do it AGAIN the next game. There was literally no explanation for such lunacy. This guy had to go. With those 3 gone we had seemingly made all the moves necessary to progress into next season. Fill in those spots with some capable replacements and we could move on. Mack said he wouldn’t try to hire a new OC until after the bowl season as to not be a distraction to those teams whom he was trying to pry their OC away from. Seemed like a very noble idea. And everyone would be on board until…. December 11, 2010: Head Coach in Waiting/Defensive Coordinator, Will Muschamp, accepts Florida’s offer to become their new football coach (DAMN YOU URBAN MEYER!!!!). Mack: Hey Will, I'm thinking about staying another year. What do you think? Will:You sonofabitch. As Cam Newton is suffering from a severe case of word vomit during his Heisman acceptance speech (yes, he did thank the troops (that’ll get ’em on my side)), Will Muschamp bolts like a thief in the night to Gainsville, Fl to accept the recently vacated head coach position for the Florida Gators. Unlike Urban, I don't pull out. EVER. And yes, I just managed to fit a Titanic reference into this post. Things have officially reached catastrophic levels for this program. There are talks that Texas legend, Major Applewhite, might be joining Will at Florida. Leaving a void in what was presumed to be the future OC or head coach at Texas since Muschamp is leaving. Mack has to not just make multiple hires, but multiple GREAT hires to his staff. Recruits are already thinking about decommiting. This is of course going down on the SAME weekend that at least 10 recruits are taking their campus visit to the University of Texas. There is nothing but uncertainty in Austin these days. Mack has yet to hire anyone to fill up these vacancies and we’ve gone into some serious guesswork trying to figure out the direction he’s going to go in. Since nothing is finalized and the people we thought were going to fill some of these spots haven’t yet, I’m not going to go any further into the issue since it is just guesswork. I will be updating as this thing becomes a bit more clearer. Stay tuned. I love the way you started this off! I would have skipped the first few games too, but even in those games we looked shaky at times. Our “talent” won those first two, but if you remember, Mack came out and said he was disappointed after the Rice and Wyoming games. The offense was awful. THEN came Texas Tech, which we won, but it was the first game where Britt Mitchell got absolutely exposed. He got dominated by a no-name D-lineman and made him look like Reggie White or Suh.